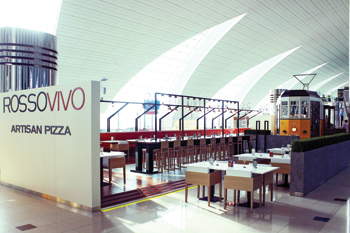 The Rossovivo at the Dubai International Airport. 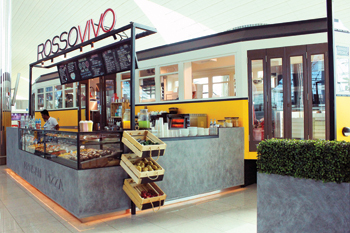 A brightly coloured Italian tram in an airport is sure to grab the attention of passengers and it was precisely this concept that Retail Access has used to advantage in designing a restaurant for an Italian pizzeria at the busy Terminal Three of Dubai International Airport in the UAE. Faced with the space constraints along the airport’s concourse, the design consultancy has taken its inspiration from the iconic Milan tram, with a long and thin design, in delivering the new Rossovivo restaurant under a design-and-build deal. 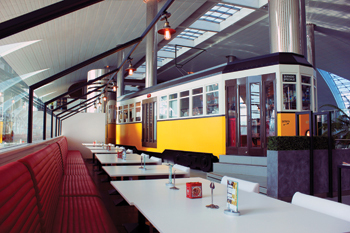 The tram puts the main kitchen for the restaurant virtually on a stage, allowing customers to view live preparation of the pizzas through its large windows whilst dining in a spacious environment. “Work on the project started in October 2013 with what we call the Phase Zero,” says Hugo Vanderschaegh, director of Retail Access Middle East. “All our projects start with this crucial phase, during which our team adds value to the client’s brief by taking a shopper-centric approach and analysing the path to purchase. ‘Phase Zero’ here is the research and recommendations stage. We started the design stage in early January 2014 and finished the project in November 2014. The project took a little longer than usual as it had to factor in the time needed for the various approvals by the airport authorities and make sure the certification and other activities followed the airport rules and regulations,” he adds. Rossovivo Artisan Pizza is already well established within the sphere of the traditional Italian pizza but with this branch, the client wanted to expand the boundaries of the brand and introduce a lesser known version of pizza, more suited for areas with high pedestrian traffic as the airport. “We have designed a space that communicates the idea of an urban landscape because the ‘pizza alla romana’ was originally served as Italian street-food and gave diners a choice of toppings. This same concept has been built into the restaurant which finds its interpretation as a vintage tram,” Vanderschaeghs says. The juxaposition of Italian heritage in the heart of an ultra-modern airport has created a memorable distraction for travellers, who are given an opportunity to enjoy a meal that momentarily transports them to the Italy of the 1920s, he adds. Customers get to view live preparation of pizzas. Retail Access has reviewed the restaurant’s fit-out with upscale finishes such as stained granite, industrial metals, street-like lighting and natural woods. It has also added connotations of Milan with three digital screens that display city visuals and tram seating. The restaurant offers takeaway and table service, which was addressed by Retail Access with multiple entry points to help the customer journey through the ‘tram’ and allow waiters freedom of movement. “The live preparation of the pizza was a key element of the client experience. We created the tram as a stage to highlight the dough preparation with a maximised visibility through the windows. For instance, Rossovivo has three different types of seating that can accommodate people travelling alone or in groups; passengers in transit with long hours at their disposal to be spent at the airport; or passengers with very limited time. “During the whole construction period, Retail Access was following up with the contractors to ensure the quality and accuracy of the fit-out meets the design and brand requirements. Also, constructing an outlet from scratch in an international airport means going through various rules and procedures which can be very challenging at times. We, however, found effective solutions to several technical constraints, ensuring the result aligns with the vision and ambition that was set on the brief for this outlet,” he says. All furniture has been sourced from an Italian firm. All the loose furniture like tables, stools, chairs were selected from a renowned Italian brand specialised in hospitality furniture. Commenting on difficulties faced while executing the project, he says given the airport’s stringent safety constraints, Retail Access had to demonstrate flexibility and creativity to work around them. As Rossovivo is in an open-air environment with no direct ceiling, the MEP (mechanical, electric and plumbing) engineering services had to run below the floor. Apart from the Rossovivo brand, the key players on the project included Retail Access for design concept, development and execution follow-up; Pedrali for the furniture design and manufacturing; Top Rock Interior, the fit-out contractor; and Vindico, Dubai airport’s retail delivery management company. Retail Access is a design consultancy that can enhance, create or adapt retail experiences. It has specific experience in POS (point of sale) and category management, operational consultancy, retail design, architecture and brand strategy to give clients an integrated solution along the path to purchase. For more than 10 years, the company has worked closely with international leading brands in cosmetic and fragrances, wines and spirits, fashion and jewellery, food and beverage and the service industry, to create, design, implement, and roll out their global architectural programme.